Click on the questions below for detailed answers. Q: I hear that the big handyman stores like Lowes & Home Depot now remodel kitchens and bathrooms. What are the differences between remodeling companies, and these types of stores? Q: How many estimates should I get for a remodeling project? Q: I have three different estimates, and the prices vary greatly. Why? Q: What can I do if something doesn’t look right or I catch a mistake? Q: I hear that the big handyman stores like Lowes & Home Depot offer remodeling services for kitchens and bathrooms. What are the differences between professional remodeling companies and these types of stores? A: The main differences are quality and service. If you know exactly what you want, and can pick it out at that store, and are prepared to stay at home supervising your remodeling project, then the installed sales department at the big handyman stores might be the way to go. Quality of installation and attention to detail are not trademarks of these companies and custom remodeling is usually out of the question. 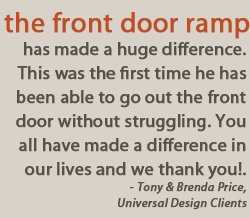 Why choose a professional remodeler? 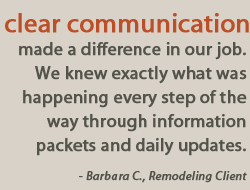 During a remodeling project, there can be a lot of unforeseen damage or conditions. 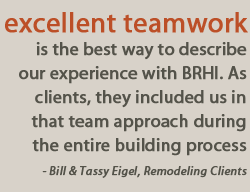 A remodeling company usually has the time and resources to deal with these circumstances in a timely manner, and keep things moving and they have more flexibility to get the job done. Usually, the big handyman stores do not readily have high quality materials that more and more people are looking for. Typically, manufactures will make lower quality products to sell to the big handyman stores, then those they sell to plumbers and remodelers. Every situation is different, but carefully compare estimates from each of these types of companies. Is it an apple to apple comparison? Usually not. A: I’m sure you have heard to always get three estimates for any work you are going to have done. Well, that depends on a lot of factors. If a contractor has been recommended by a friend, you have seen his work and are satisfied with the quality, and YOU have met and talked with the contractor and are comfortable with him, then maybe you only need to get his estimate. If you feel his price is reasonable, I would say go for it. On the other hand, if you are getting bids from contractors that you have no personal experience with, get three bids. If the bids are within 10-15% of each other, then choose based on your comfort level with the contractor. If the three bids have huge differences, you should probably investigate a little further. Either, a contractor didn’t include something that another did and the bids are not “apples to apples” bids, or there might be something suspicious about a contractor with an extremely low bid. Just be careful and take a closer look. A: There are a number of different factors that go into pricing a remodeling job. Check the obvious first. Make sure that every estimate has the same scope of work. If the details aren’t clearly specified or you are having trouble understanding the information, go back to the contractor for clarification. Get your questions answered IN WRITING, not just a “yea, it’s included” over the phone. If you are not satisfied with the response or have trouble getting it in writing, eliminate that contractor. 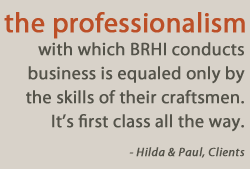 Quality of work, level of service and cost usually go hand-in-hand. If the contractor spends lots of time picking out high quality products and materials and paying close attention to details, it will most likely cost a little more. Also, if the contractor carries the required licenses and insurances, the cost will also be affected. Quality of work, hard to show in a written estimate, is also a factor in costs. Piece of mind that your are in good hands is worth extra money up front to most people. If you need extra assurance, confirm that the cost difference if valid by calling references or visiting jobs the contractor has done in the past. A: The most important thing you can do is talk to the contractor RIGHT AWAY. Don’t be afraid to ask questions. If there is something that doesn’t look right, or you think you ordered one thing, and something else is being installed, just ask! If you’re not happy with something, or something doesn’t look right, a professional remodeler has the time and resources to answer your questions and get the problem take care of right away. There are no dumb questions, remember, it’s YOUR money. It will save a lot more time, money and headache if you catch the problem early. Remember, remodelers don’t know what’s going on inside your head. So don’t be afraid to check out the site often and voice your thoughts.